Kadhi is another word for 'curry'. Kadhis are almost always vegetarian and are soup like in consistency with either vegetables or fritters in them. They are made differently in different parts of India. 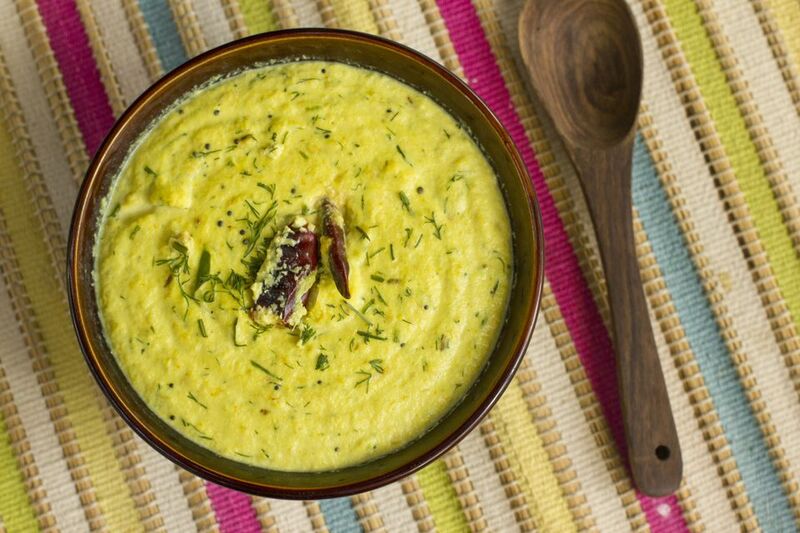 Unlike the Kadhi made in North India, South Indian Kadhi does not include Pakodis (gram flour fritters) or turmeric. It is made with yogurt so has a distinctive tangy flavor unlike its North Indian counterpart. South Indian Kadhi is a mild dish and is fairly easy to cook, which makes it a great family dish to throw together quickly. It is considered good to eat when you have an upset tummy as it is made with ingredients that have digestive properties. It does not keep well so must be eaten as it is made because reheating will cause the yogurt in it to curdle. Heat a griddle on medium heat. When hot, add the cumin seeds and dry roast until they are slightly fragrant and start to get darker in color. Take off the griddle when this happens and leave on a plate to cool. Mix the grated coconut, green chillies and toasted cumin seeds and grind to a smooth paste in a food processor. Whisk the yogurt till smooth and add a cup of water to it. Stir to blend well. Add the coconut-spice mixture, salt to taste to this and stir well. Put the mixture in a heavy-bottomed pan and heat slowly on a medium flame. Stir occasionally to prevent the mixture from sticking to the pan or scorching. Milk and other dairy products seem to scorch easily! At the same time, heat the vegetable/ canola/ sunflower cooking oil or ghee in a small pan on a medium flame, add the dry red chillies, cumin seeds and curry leaves to it. They will splutter so be very careful to avoid getting burned by the hot oil. Cook till the spluttering stops. Just before the yogurt-coconut-cumin mixture comes to a boil, turn off the heat and add the above Tadka or tempering mix (oil, cumin, dry red chillies and curry leaves) to it. Now garnish with freshly chopped coriander and serve with Basmati rice.